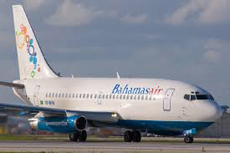 Bahamasair wishes to advise the traveling public that due to Hurricane Joaquin's impact on the Southern and Central Bahamas, all flights to those destinations tomorrow will be cancelled. Further advisories will be issued as new information becomes available. Bahamasair wishes to advise the travelling public, that due to the impending arrival of Hurricane Joaquin, the following flights will be cancelled tomorrow October 1, 2015. Persons travelling to and from these destinations tomorrow can contact our reservations department to make alternate reservations. All other domestic flights and flights to Florida will operate as usual.